The library sent me the 1996 edition with Barbara Garrison's prints, instead of the original 1969 edition with Leonard Weisgard's illustrations. I'm crushed, frankly. Garrison's are wan and brown and sometimes only occupy a fraction of the page; Weisgard's are deep blue and fill the page:Why would you ever put out a new edition without Weisgard's pictures? It boggles the mind. This book may be dated, but its concepts are amazing. In the future as a teacher I will be able to use this book to teach both reading and link to geography by showing the students how connected we are to the world around us. It would be a comforting book for students whose parents are maybe at war or have family that is away in the world. I loved this book and the illustrations were phenomenal as well. Beautiful deep blue Weisgard illustrations. This is a 400 book. 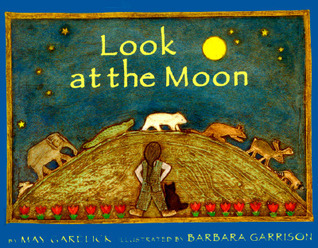 Excellent artwork and fun rhymes throughout make this an entertaining read about the moon.